This chapter identifies the complex problem and challenges that face higher education in Science, Technology, Engineering and Mathematics (STEM) disciplines. In particular, it investigates a conceptual framework to address how to leverage the affordances of learning technologies to improve academic practices and curriculum development within the STEM disciplines? It includes a comprehensive exploration of the literature and evidence-based practices that informs the key themes underlying this challenge. 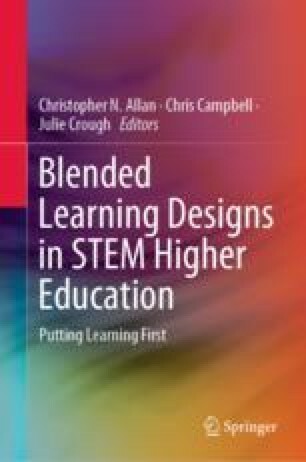 The chapter investigates why change is needed for learning and teaching in STEM disciplines; explores the research findings in STEM higher education; critically reviews reflective practice and academic development; plus considers the barriers to, and drivers for, change to transform STEM higher education. The discussion contextualises the problems and challenges within the setting, parameters and opportunities at Griffith University. Collectively, these considerations inform how the affordances of learning technologies can support integrating professional practices and pedagogical change across purposes, time and space. Thank you is extended to co-designers Dr. Sebastian Binnewies and Dr. Christopher Love, as well as Dr. Geraldine Torisi-Steele, Dr. Sven Venema, Simon Howell and other Griffith Sciences colleagues for their valuable contributions to resolving many of the issues addressed in this chapter. Many other Griffith University colleagues are acknowledged for their contributions through professional conversations—including Dr. Jude Williams, Dr. Lynda Davies, Dr. Paula Myatt, Georgina Sanger, Louise Maddock and members of the Griffith University Active Learning Working Party. Feedback from course coordinator on assessment tasks and student outcomes. American Association of Universities. (2018). STEM Framework. https://www.aau.edu/education-service/undergraduate-education/undergraduate-stem-education-initiative/stem-framework. Accessed 22 May 2018. Carnegie Foundation. (2018). Six core principles of improvement. Retrieved August 8, 2018, from https://www.carnegiefoundation.org/our-ideas/six-core-principles-improvement/. Shadle, S. E., Marker, A., & Earl, B. (2017). Faculty drivers and barriers: laying the groundwork for undergraduate STEM education reform in academic departments. International Journal of STEM Education, 4(8). https://doi.org/10.1186/s40594-017-0062-7.